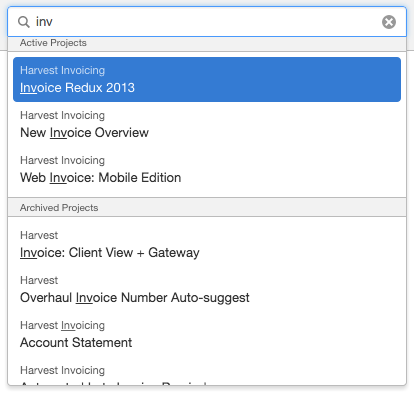 Harvest makes it easy for you to stay on top of your projects’ budgets, profits, costs, and trends. Blue shows how much of the budget has been burned—and as your project progresses, the blue will grow until it hits the budget. Once the project is over budget, you’ll see a red bar grow. We hope you see more blue and less red! By default, the Projects Overview shows you all active projects. 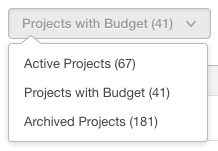 You can use the filter menu (top left of your Projects Overview page) to see just projects with a budget set up or all archived projects. The search box stays in the top right corner throughout your Projects section. Once you click into a project, you can quickly jump to another project with search! Who Can See What in the Projects Overview? Here are a few key things to know about who can see what on this page, broken down by permissions level. Any projects they’ve been assigned to that have been set to Show project report to everyone on the project (see the Regular Users—Additional Permissions section of this article for more information on this setting). Only hour-based budget information for those projects, never fee-based data. Potentially nothing! This section will appear empty to regular users who aren’t able to see any project reports, but they’ll still be able to track time to their projects over in the Time section. All of the projects they manage. Projects where they’re set as a regular user, if the project-specific permissions show the project report to everyone. Fee-based budget information for projects they manage only if they have the View billable rates and amount permission (see the Project Managers – Additional Permissions section of this article); otherwise, only hour-based budgets will be visible to them. All of the account’s projects, even any projects they haven’t been added to. Total project costs—only administrators can see cost rates and, therefore, total project costs.